Device names are an often overlooked, but important, detail when setting up your devices. When you’re troubleshooting your network The Complete Windows Network Troubleshooting Guide The Complete Windows Network Troubleshooting Guide Got an internet or network issues? We'll guide you through your network setup and show you simple troubleshooting techniques to find and fix the problem. Read More or otherwise need to distinguish between machines, it’s a lot easier when they have names like Bill’s Laptop instead of COMPUTER-8319. The same is true for printers. Windows keeps track of all printers you’ve connected to your PC, whether they’re on your current network or not. If you have two printers with similar names, you might want to rename them so they’re easier to keep track of. Open the Settings app. The Windows Key + I shortcut will do this instantly. Enter the Devices category and select the Printers & scanners tab on the left. Click the printer you’d like to adjust and select Manage. If you don’t see yours listed, make sure you’ve set your printer up correctly How to Set Up Your Printer in Windows 10 How to Set Up Your Printer in Windows 10 Printers have a reputation for being difficult to set up. In Windows 10, however, it's actually a breeze. 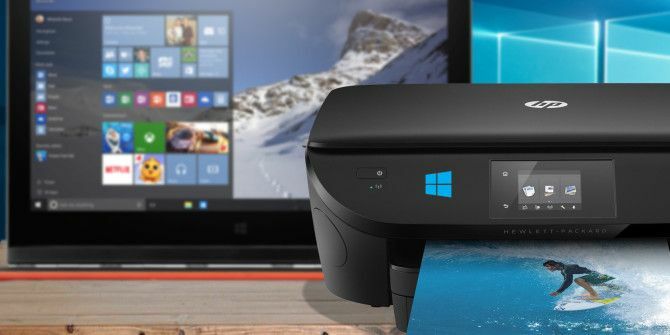 We'll show you how you can get Windows 10 to detect and connect to your printer. Read More . On the resulting screen, select Printer properties. You’ll see a new dialogue with all sorts of options for your printer. On the General tab, change the name next to the printer icon. While you’re here, you can also add a Location and Comment if that helps you further distinguish printers. Open the Control Panel by searching for it in the Start Menu. In the top-right, change View by to Small icons or Large icons if it currently says Category. Select the Devices and Printers entry. Scroll to the Printers header and find the printer you want to rename. Right-click it and choose Printer properties. You’ll see the same dialog box as above, allowing you to change the printer name, location, and comments. For more help with printers, check out the easiest ways to share printers on a network The 3 Easiest Ways to Share a Printer Over a Network The 3 Easiest Ways to Share a Printer Over a Network You can share your one printer with multiple PCs across a local network. We explain how to set this up in Windows. We also show you alternative ways to share your printer. Read More . Explore more about: Printing, Troubleshooting, Windows Tips. Articles like this is why I visit MUO every day. Thanks! Sir ? Can I ask .something . my flash drive is write protected and I can't format it many times i tried .I also performed some steps how to format write protected that I've watch in YouTube but still nothing . I install a driver pack in my my flash drive in an computer but my classmate get my flash drive even its not done copying the driver pack and not even ejected. Can I recover it ? Surely even in Windows 8.1 there's a sensible way to find Control Panel? These endless "search for it" instructions are really dumbing down everybody. I'm not sure how telling people to search for a utility is dumbing anything down? If it's the easiest way to locate a program, what's the issue? In Windows 7, you can access it right from the Start Menu. In earlier builds of Windows 10, it was built in the Power User menu (right-click the start button). But it's not there anymore, so searching is the easiest way to find it.